I have this love and hate relationship in cooking non vegetarian food. I love it because I can experiment more; sky is the limit as I am not going to taste it. ;-) I hate it because I've to cook another veg food for me. So whenever I am in a good mood, I would prefer cooking non veg and the simplest of them is prawns. They cook easily and as I use store bought cleaned & deveined prawns, so my cooking gets complete in no time. I always use coconut powder or just coconut flakes to thicken any gravy. This recipe uses rice powder for thickening. My Hus said he didn't find any difference. But this is a good alternative whenever coconut goes out of stock. She has used freshly ground mixture of spices and rice, but I used all store bought spice powders as they are all sitting in my pantry for long days. I need to finish them off before I leave to India for my vacation next month. Thanks Uma for this recipe. Chop Onions and tomatoes. Grind tomatoes to a smooth paste. Clean prawns. Marinate the prawns with little Chilli powder, salt and turmeric powder for at least 20 minutes. Heat Oil in a Pan, add all ingredients listed under "to temper". When they turn slightly brown, add ginger garlic paste and chopped onions. When onions turn translucent, add the ground tomato paste. Fry till the oil separates and now add in all the masala powders. Fry for a while until the masala is well combined with the mixture. Now add the Rice powder and water. When the water starts boiling well, add the marinated prawns. Cover and cook for 8-10 minutes or till done. 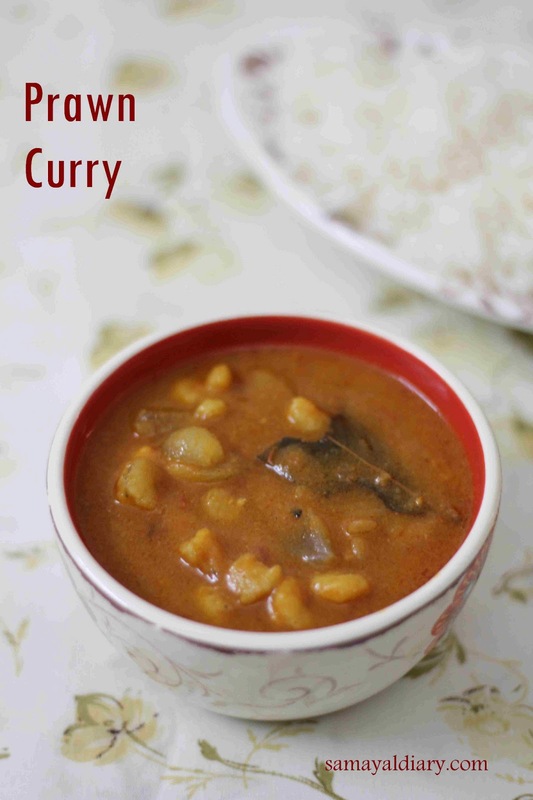 Serve with hot steamed rice or any flat bread.